The Wong List: MAKING ORIGINAL CENDOL! Cendol has always been one of my favourite desserts here. It originated from Indonesia and the word ' jendol ' in Javanese means 'bulge' or 'bump' which refers to the green wormy bulgy like jello! This dessert exists in South East Asia including Vietnam, Thailand, Singapore, Malaysia and of course Indonesia. The Singapore and Malaysian versions have red beans in it. Don't ever mention that to any Indonesian as it is a sin to put red beans. The Teochew people did that! I prefer the original Indonesian version with no red beans. You can keep your beans. Put chopped leaves, water and whiz in a blender. Strain to get 625ml to 650ml of pandan juice. to mix before passing through a sieve. Add alkaline water to the flour mixture and set aside for 1/2 hour. turns to a translucent green. Fill a basin with ice and cold water. Set chendol mould over it. Remove cooked batter from heat.Spoon out a lump onto the chendol mould (metal sheet with holes). chendol form in the ice water. Repeat till all batter is used up. Drain chendol from ice water and use. Mix water to the grated coconut and mix by hand. Squeeze over a sieve to extract as much milk as possible. Pour milk into a pot and add a pinch of salt and the 2 pandan leaves. Simmer in LOW heat till the milk is warmed through. Place all the ingredients in a small pot and let it simmer until all the gula jawa has dissolved. Remove from heat. 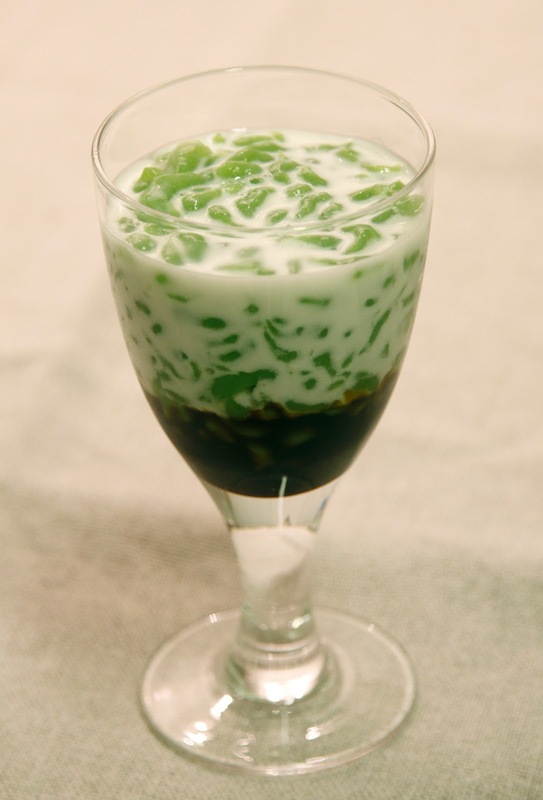 In a nice glass, layer the gula jawa first, then the chendol and finally the coconut milk. Add crushed ice. Serve. NOTE: There are no red beans in the original form of Es Cendol from Indonesia. You can sometimes add jack fruit slices if you want. Nothing like making Cendol to Earth Wind & Fire! Nice! Wish I had the patience to show step by step photos. Love the music on the vid... classy! My cendol director insisted on step by step pix; i'm only the photographer! btw, I love the black and white photo of your bamboo forest. Brings me straight back to the Sagano bamboo groves in Arashiyama, Kyoto. Thanks for allowing me to relive that experience! Just going over your recipe: is 30 pandan leaves correct? I saw another version, about the same total amount and that had only 3 leaves. Just checking. What happens if you don't have alkali water? Nice !!! Oldies way is to use rice flour but less popular nowadays, also use indonesian coconut/coconut milk for more authentic taste. Is it green bean flour or green peas flour, you mention both. How much pandan extract do I use ? I cannot find fresh pandan leaves.